Half Price Madness In Our January Sale!! Hello, there! We hope you enjoyed a happy and healthy Christmas and New Year period. Here at Apache, it’s that special time of year when we offer fantastic deals on our end-of-season stock, just before the Spring Summer 2017 season gets into full gear. Rest assured, everything in our January Sale is a genuine reduction, taken from our successful #AW16 range. Call it good, honest, local independent retailing – no multi-store shenanigans at Apache! Be warned: #SS17 is imminent, so now is your last chance to get your hands on a wide range of quality gear at clearance prices. Stock is obviously limited, so our January Sale is a first-come, first-serve event, not to be repeated until next year. As a little gift from us, you can claim a further 10% off throughout January with the unique offer code “JANSALE“. Here’s just a taster of what’s still available as we speak… but be quick! 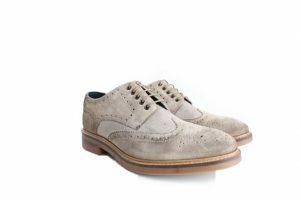 Check out these classy Suede Brogues by Base London, now incredible value at only £35. A traditional British derby brogue with a contemporary twist, the “Woburn” sits proudly on a chunky, studded compound sole to give a comfortable step. The shoe boasts a quality leather lining for a luxury edge, as well as decorative toe detail and traditional wing tip toe cap. 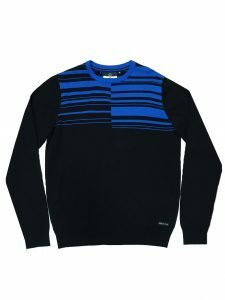 Duck and Cover are responsible for some of our best knitwear, such as this fine-gauge 100% cotton knit in Black. The distinctive geometric patterns – which also features in Anthracite Marl – set this jumper apart from the competition in our January Sale. It’s a perfect match for a pair of jeans, or to go snugly under a winter coat or jacket. Jiggler Lord Berlue apply their trademark eccentricity and attention to detail to this fantastic semi-tailored number. The Dante shirt is made from 100% sateen cotton, making it a joy to feel and wear. 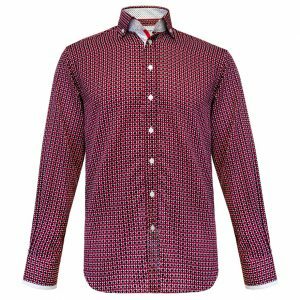 It features a stunning burgundy, black and white all over retro print that is bound to turn heads at any occasion, whether a birthday party or a night out. This gorgeous shirt/polo crossover is made from typically 100% pique cotton, lending it the look and feel of super-soft linen. This hybrid a fine example of the innovation and style that has made Farah our fastest-growing brand. A real highlight from our January Sale. Don’t forget – Spring Summer 2017 is fast approaching. We’ll be adding brand new arrivals every week, as well as putting more items into the sale throughout January, so keep your eyes peeled. In the meantime, use our discount code “JANSALE” on any sale item and enjoy a beautiful bargain to kick off the New Year!